NOTICE: We have one of the very first all-electric Vespa Elettrica's off the assembly line in Italy – #00003! – but only until this Friday April 19. So, get yourself into our Wrentham, MA showroom for a look before we have to ship it! 1.99% Financing for 36 Mos. Drop by Our Wrentham Showroom Today and Check Out the All New 2019 Vespa's Arriving Daily! Vespa Primavera Sport features a fully digital dashboard and instrument panel with a full color TFT display. New features include a distinctive “tie” on the front and a slick looking chrome crest on the front mudguard. The name Notte - Italian for night - is a fitting introduction to its décor, characterized by total black graphics. The Primavera Yacht and Yacht Club skillfully pair an elegant white outfit with numerous blue details. The collaboration between Piaggio Group and (RED)® has lead to the creation of VESPA 946 RED, a Vespa clad in shiny red, designed to benefit the programs to fight AIDS, tuberculosis and malaria, promoted by the organization founded in 2006 by Bono and Bobby Shriver. $360 million collected so far by the Global Fund has reached Ghana, Kenya, Lesotho, Rwanda, South Africa, Swaziland, Tanzania and Zambia, and have fully been invested in research, prevention activities, treatment, drugs, HIV tests, and medical assistance, impacting over 70 million people. Those choosing a VESPA 946 RED will join Piaggio in fighting the AIDS virus and helping women become mothers of healthy children. Stadium Vespa sells the full Line of Piaggio scooters and is an authorized service center for southern New England. You know you want one. Stadium Vespa is a fully authorized sales and service center for the full line of Vespa scooters. Now you can customize your Vespa or Piaggio scooter to get the maximum riding experience and performance you've been craving. 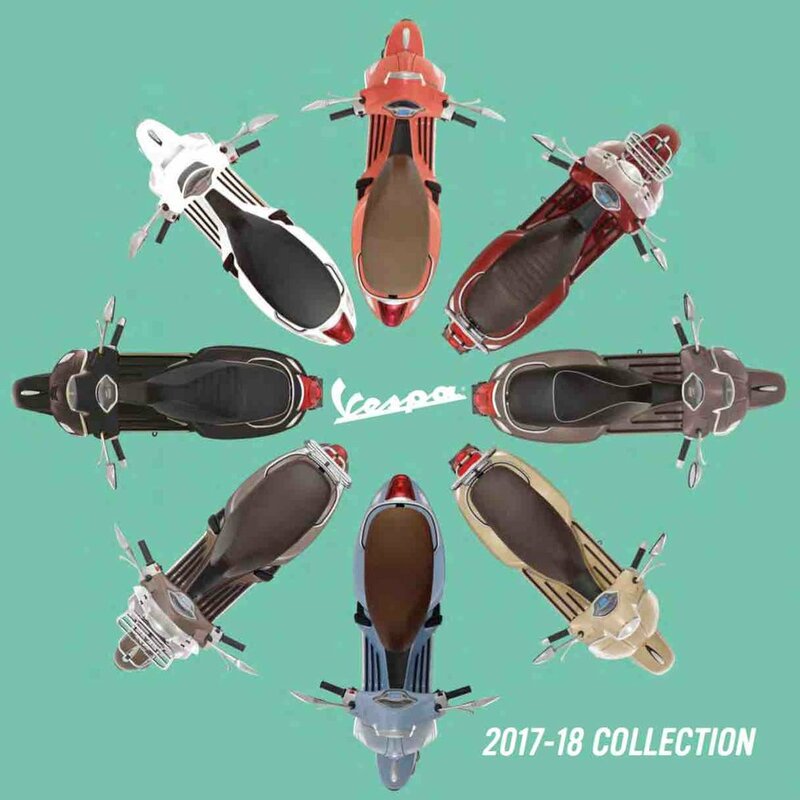 Vespa's catalog is a colorful, fun and informative way to check out the full line of scooters and accessories.